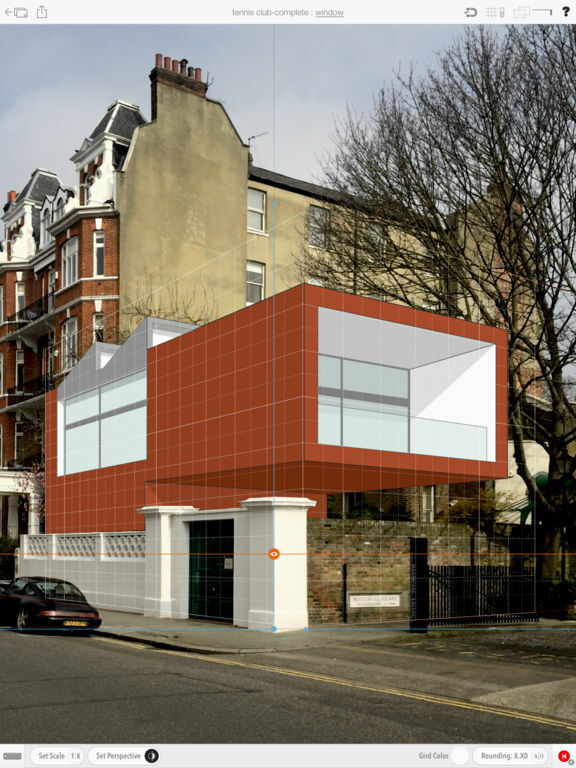 [prMac.com] London, United Kingdom - Open Screen Ltd. today is proud to announce the release and immediate availability of Archisketch 2.5, a major update to its scale-aware sketching app on iPad. Providing architects and designers more efficient and granular user control than ever before, Archisketch 2.5 customers can now pan and zoom simultaneously in the drawing environment, plus duplicate projects with email sharing, modify and move entire groups of shapes, and much more. Archisketch 2.5 also features enhanced controls for getting the most creative expressiveness from using the Apple Pencil(R). In addition, the update includes an improved two-point perspective grid layout, a modernized Projects system, and dramatically enhanced discovery for items in the scrapbook. "Apple Pencil support introduced in Archisketch 2 was met with resounding enthusiasm," explained Reza Farhad, founder of Open Screen Ltd. "We took Apple Pencil support to the next level, plus added more control over drawing sketches. CAD users will find more familiar features, making Archisketch on an iPad a natural part of the creative process." The Archisketch Freehand tool can now take full advantage of the advanced sensors in the Apple Pencil, which accurately measure pressure and tilt for a natural drawing experience. The Sketch toolset also introduces a new Spray drawing mode that really brings a sketch to life. Archisktech introduces integrated features, which are familiar from all standard desktop CAD applications. Now, in version 2.5, it's easy to group elements together, plus a group can be modified, edited and moved in unison. By taking well-established working processes, which are second nature to designers, it is more natural than ever to integrate Archisketch 2.5 into the creative process. Adding the ability to combine sketch elements with other CAD features, such as grouping a set of freehand lines, Archisketch takes full advantage of what the iPad and the Apple Pencil offers as a digital sketchbook. Archisketch 2.5 brings an internal two-point perspective grid to the list of grid options. When using internal or external two-point perspectives, an inner block can be set up within the perspective environment to help with the drawing process. The Projects system now includes display of thumbnails of the drawings for easy navigation. Projects can now be duplicated, and even shared via email between users. Drawings from one project can be copied and pasted into a different project. The Scrapbook environment is now more navigable with new naming and Search capabilities. The Share environment now provides the means to add a drawing to the Photos app. Archisketch is a scale-aware sketching program ideal for Architects, interior and landscape designers, product designers, design students, or anyone working with design on an iPad. Inspired by the tradition of sketching on a tracing pad, Archisketch brings sketching into the modern era on an iPad. Archisketch helps architects and designers visualize, capture and explore their ideas using layers, symbols, colours, dimension guidelines, 2D grids, isometric and axonometric 3D grids, and even smart one- and two-point perspectives for 3D. When finished, drawings can be printed to scale directly from the iPad up to A1 size, or exported to PDF, which can be included in a CAD application, or uploaded to Adobe Creative Cloud. Archisketch 2.5 is available immediately from the App Store as a free download for use with up to 30 shapes in two projects, with an in-app purchase for unlimited shapes and projects for an introductory price of $9.99 USD (regularly $14.99). It is a recommended update to all Archisketch customers. For more information, please visit Archisketch's official website. Open Screen Ltd. is a privately held company headquartered in London. All Material and Software (C) Copyright 2017 Open Screen Ltd. All Rights Reserved. Apple, the Apple logo, iPhone, iPod and iPad are registered trademarks of Apple Inc. in the U.S. and/or other countries. Other trademarks and registered trademarks may be the property of their respective owners.